(TibetanReview.net, Apr10’19) – A California-based UNESCO-run body is bringing a group of six Tibetan youths from a village in China’s Sichuan Province under a UN poverty-relief programme to perform a “Chinese” intangible heritage “Yak Dance”, reported the IANS news service Apr 8, citing China’s official Xinhua news agency. 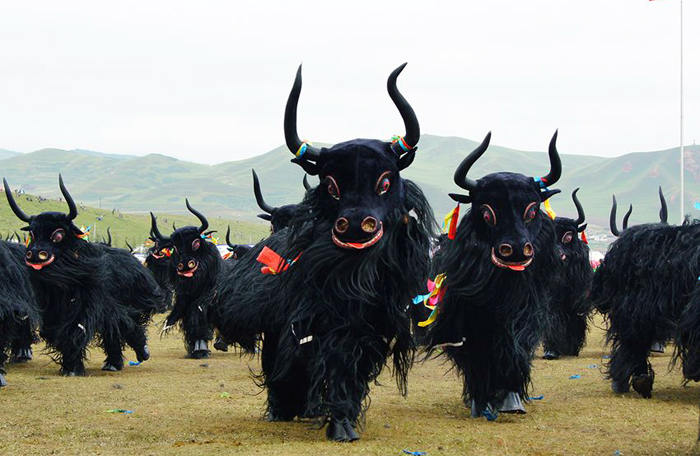 Yak dance is typically a Tibetan dance and many aspects of Tibetan culture have undergone Sinicization under Chinese rule to make propaganda presentation of them as part of Chinese heritage. UNESCO is the most controversially China-compliant and -subservient of UN bodies especially on account of the latter’s increased funding for it in recent years. The report cited Hwa A Lim, a board member of Asian Hustle and Salsa Association (AHSA) World, a California-based non-profit organization dedicated to skills development, literacy promotion and poverty alleviation, as saying Apr 7 that six ethnic Tibetan youth from a village in Pingwu County, Sichuan Province, will come to California in celebration of World Dance Day. AHSA’s aim is to help poverty-hit children become literate and develop skills for future careers. Pingwu is the northernmost county-level division of the prefecture-level city of Mianyang in Sichuan Province. The ethnic Tibetan youths will perform a Chinese intangible heritage “Yak Dance”, a traditional ritual dance popular among ethnic Tibetan groups in Sichuan, at the 2019 AHSA World Dance Day Charity Night on Apr 28 in the San Francisco Bay Area, Lim was cited as saying. “They’ll be visiting us for about 10 days. We’ll take them to different schools, to different places and even to visit some companies,” Xinhua was reported to have quoted him as saying. Lim has said this year’s celebrations will focus on the theme of poverty-relief and quality education. Lim is described as a bioinformatics expert at the UN Food and Agricultural Organization and a member of the International Dance Council (CID). The report described CID as a non-governmental organization founded in 1973 within the UN Educational, Scientific and Cultural Organization (UNESCCO) headquarters in Paris. AHSA World is said to be the sponsor of the project “When Creativity Meets Poverty Alleviation and Education” nominated for the 2018 UNESCO Literacy Prizes, which was later incorporated into the SDG4-Education 2030 agenda.